We pursue an independent foreign policy and our conduct of external relations is based on a balanced outlook.No one compromises on nationalism. For us, nationalism is the protection of our sovereignty, territorial integrity, national independence, and fulfilment of our national interest. I feel honoured to be here amidst this enlightened gathering. I consider this as a distinct privilege. I am thankful to India Foundation for providing this occasion to share my humble thoughts on the future prospects of Nepal-India relationsand broader geopolitical context surrounding us. Two years back I was in this great city on my first State visit to India as Nepal’s Prime Minister. My country had then just accomplished the historic task of promulgating the Constitution through a democratic process of the elected Constituent Assembly. That was an important moment. We were living behind the long and costly period of political transition and uncertainties, anticipating a stable political course ahead. As the Prime Minister of the country, I had the huge responsibility to carry forth the tasks related to the implementation of the Constitution that was just born. The task was demanding; challenges colossal. Thanks to the wisdom and perseverance of fellow Nepali leadership and the 28 million Nepali people as well as support and solidarity of friends from neighbourhood and around the world, we have achieved all major milestones in constitution implementation in the past two years. And this time, I am visiting India asNepal’s Prime Minister elected through the first ever polls held under the Constitution; as the leader of a country that looks to future with resounding optimism and abounding dreams. The local, provincial and federal elections heldin 2017 were historic in many ways. Following these, we were able to have elected representatives in all 753 local level bodies after a gap of nearly two decades. And, provincial elections are entirely new. A major political transformation envisaged in the Constitution was the restructuring of the State into federal set up. For the first time in our history, we now have seven provincial assemblies and provincial governments. ‘Government at doorstep’ is our constitutional spirit, which has now been structurally realized. The elections were hugely participative and results were inclusive. Voters’ turnout was over 70 percent in average. Through the elections, we have been able to ensure over 41 percent of women representation in elected bodies. This is not a small achievement by any standard.And, our intention is to bridge the remaining 9 percent gap. With this political process completed, we now have embarked on the path of political stability. All provincial governments command support of two third majority in their respective assemblies and my government at the centre has robust mandate and overwhelming support. I have deemed this as a mandate to work for the long-cherished socio-economic transformation of the country. Ours is the dream of a prosperous Nepal where people will have decent living and youths will have decent jobs; where our infrastructure will be better and our vast, untapped resources will be converted into economic benefits and wealth. It’s a dream of overcoming the vicious circle of poverty, underdevelopment and social backwardness. We are mindful, however, that we alone cannot undertake this journey to prosperity. We will continue to count on support, solidarity and goodwill from friends all over the world, particularly our neighbours. I say neighbours as they, by virtue of geographic proximity and long historic associations, are the ones who understand us well and are cognizant of our development needs. I say neighbours as, fortunately for us, they have been able to register marvellous achievements when it comes to development and hence, they are our inspirations, our lessons and key source of support. Nepal and India are connected by geography as well as history, by our religions as well asculture. Our relations are blessed by the wisdom of saints and sages. Our bondsare strengthened by both physical connectivity and people-to-people interactions in almost all spheres. Our relations began even before the history began to be recorded; they began in the dawn of human civilization in this part of the world. Today, in this 21st century, our age-old relations have expanded to a more extensive, and multidimensional connection. It is a neighbourhood reality that we often witness intermittent glitches in our relations. It is a fact that we have witnessed difficult times in our relations. We have gone through the cycles of ups and downs; highs and lows in our relations. I am sharing this frankly because open discussions help improve the thrust and course of relationship.We, leaders on both sides, are capable to review and introspect where things went wrong and how we could do better in future. And the history implores us to take our relations to newer vistas of opportunities, to newer heights of mutual benefits. In this mission, it is natural that we have certain expectations from India as a large neighbour and a country with rising global stature in many ways. Relations between neighbours differ from that of others. Neighbourhood realities are distinct in many respects and accordingly dictate the terms of overall engagements. Good neighbourliness demands harmonious co-existence forever. And, trust is the key cementing factor.It derives its strength from the observance of such fundamental principles as equality, justice, mutual respect and benefit as well as non-interference. As friendly neighbours, our two countries need to be aware of, and respect for, each other’s concerns and sensitivities. Nepal has not allowed its land to be used against the sovereign interests of India. We are firm in our resolve to maintain this position. And it is natural that we expect similar assurance from India. We are in the changed context both at home and abroad. Our domestic political realties dictate the values and course of our action both internally and externally. We have defined our goals, priorities, strategies and actions for nation-building. Likewise, we want to inject fresh perspectives into our relations with external world. Our foreign policy priority begins at our borders. Talking about India, our foreign policy objective is to strengthen the foundation of relations, but not to weaken it; objective is to expand and consolidate relations, but not to limit the scope or unravel it; and objective is to bring our relations to the next level, but not to slide back. Our objective is clear. Our intention is pure. Our determination is strong. And, our efforts will be robust. Stability and predictability in relationship is very important for us. Because we are two countries of different size, populations, and level of economic development. And our ambition is different, so is our strength. India is aspiring to be a global power, both politically and economically. Nepal’s ambition is to be a prosperous place. We cherish India’s progresses and prosperity. Its accomplishments in many spheres are notable.The wonderful journey of India as a major economic powerhouse is an inspiration for many people around the world and more so in our neighbourhood. For Nepal, India remains the largest trading partner. However, the problem of bilateral trade deficit looms large. Our economy cannot sustain alarmingly high trade imbalance with India. Its continuance will pose a serious threat to our economy. We are not a competitor of India. We need a breathing space. I am sure many of you would agree when I say that helping Nepal to be economically strong serves India’s vital interest. Therefore, we need to focus our attention to diversify our trade basket and scale up the volume of exports from Nepal to India. The provisions of the 1996 Trade Treaty were highly supportive for Nepal’s trade. The Treaty’s initial period was an encouraging period in our trade relationship. Measures such as removal of quantitative restrictions, tariff quota reduction and downward revision of value addition criteria, simplification and streamlining of procedures and easy access to quarantine and testing facilities could ease the difficult situation. To increase the flow of goods and augment trade, we need to invest in infrastructures and streamline the procedures as well. India has extended generous assistance to finance development endeavours of Nepal. It has helped to diversify our economy, build up the infrastructure, and enhance our industrial base. However, there is much to do to scale up our economic cooperation and timely delivery of agreed projects. To further intensify the economic cooperation, we must create the stories of success; we must translate our pledges into performance. Nepal’s hydropower development is an important sector for bilateral partnership. It will benefit the people and industries of both of our countries. We need to generate a success story by sincerely implementing the projects agreed in the past such as Pancheshwor in its true spirit. Nepal is a desired destination for Indian tourists. Attracted by the natural heritage as well as religious sites, Indian tourists can further contribute to Nepal’s economy. To enhance the flow of people, for enterprise as well as tourism – we need to further expand air connectivity and road and rail linkages. Cross-border connectivity is very important to unleash development potentials and to spur growth. The importance of connectivity cannot be overemphasized for a landlocked country like ours. 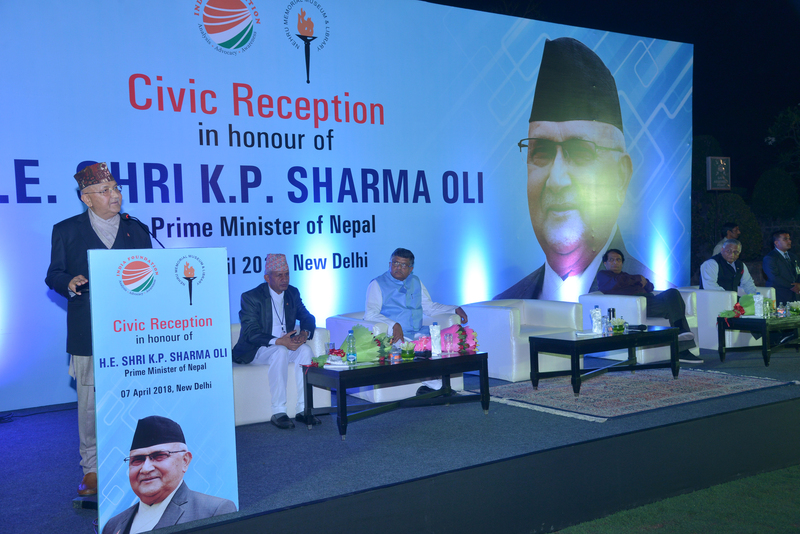 India has been providing overland transit facilities to Nepal for international trade.When I talk about connectivity I recall what Prime Minister Modiji eloquently highlighted the idea of HIT (highways, information ways and transmission ways) while addressing the Legislature-Parliament of Nepal during his first visit to Nepal in August 2014. We need to realize this vision. As connectivity is important for all of us, we underline the need for developing regional and sub-regional connectivity arrangements. We need to ensure that bilateral as well as regional connectivity and transit arrangements run smoothly without any interruption at all times.Recourse to obstacles in the movement of goods, services and people should not have any placein today’s interconnected world and in interconnected neighbourhood. We are living in an interesting time in terms of the shifting power equation in the world and the transformed geopolitical orientation. Asia’s centrality in today’s world stage has been affirmed by the fascinating combination of economics, demography and its value system. Having possessed a third of the Earth’s landmass and almost two third of the world population, mostly young and energetic, Asia’s renaissance has become irresistible and irreversible. I call it renaissance because Asia’s gain of supremacy is not a first time phenomenon. What we see today is rather the return of Asia to the glorious world podium of 200 years back. It’s a return to the time when Asia homed the world’s oldest and most affluent civilizations. Return to the time when it produced the world’s best artists and architect; best physics and metaphysics; most sophisticated education system and most enlightening writings on governance and statecraft. When majority of the world was reeling in the darkness of superstition, this region, centuries back, produced Vedanta, the world’s most elaborate treatise of knowledge and wisdom as well as a most advanced philosophical system, and Buddhism, the most revered guiding principles on peace and nonviolence; and the notion of global fraternity and happiness. Ancient Asia gave the world the advanced idea of town planning and sophisticated architecture. It also offered the idea of industry and techniques of trade. Past 200 years were rather an aberration in Asia’s prominence. Reasons may vary, but the reality is that in the past 200 years, poverty and backwardness became most of Asia’s identity. Today, Asia is already on the log march to success and prosperity. This journey may not be smooth and uninterrupted, but it is on. Natural to its size, Asia is the most diverse region in the world. People are diverse and so are cultures; geography is diverse and so is the level of development. Amidst this, how do we ensure that Asia gradually evolves into a closer, connected and a better-integrated society? How do we ensure that those lagging behind in development are offered a helping hand and a level playing field to keep up with the required pace? How do we ensure that we all, big and small, grow together as fellow Asian nations? How do we ensure that we sort out our differences or at least not allow such differences undermine the larger good that we need to pursue together? These turn out to be critical questions as we embark on the noble journey towards realization of the Asian century. As important as the tangible indicators of development are, we need to make sure that the core Asian values of universal fraternity, peaceful co-existence, respect for diversity and sense of equality guide our ways as these are the values that stand as fortress to ensure world’s peace and security and sustainability of its development. Asian values have the potential not only to bring us, the Asians, closer but also contribute to the world’s better future. These were born out of our collective, civilizational conviction on harmony, discipline and primacy of the larger public good and interest over petty individual self-centredness. Asian values emphasize more on sharing, caring and co-existing than on individual race making. Collective thinking and serving humanity is the Asian way. Asian values underscore, as the fundamental prerequisite to development, the need to build solid and well-functioning state institutions. While other actors are important components of modern day governance, state institutions must command due reverence and any ill-motivated attempt to undermine them must be discouraged. 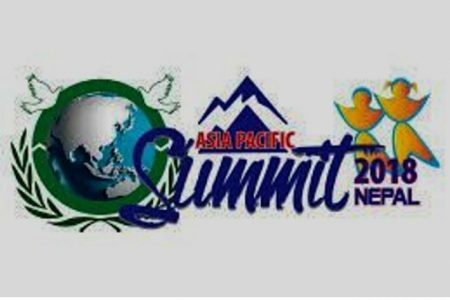 Our collective journey towards realization of the Asian century can only be possible through due promotion and institutionalization of the Asian values. Asia invented panchsheel that have not only become the core principles of the UN Charter but also provided the nations around the world the modus vivendi for living together peacefully despite differences and working together to serve mutual interest. Nepal’s adherence to panchsheel is unwavering. Nepal’s engagement with the rest of the world, as stipulated in its Constitution, remains shaped by the principles of Panchasheel, non-alignment, UN Charter, international law, and norms of world peace. Nepal was among the few countries that remained independent throughout its history. In this very fact of history is rooted the abounding sense of national pride of today’s 28 million Nepalis. We, therefore, hold dearer than anything else the principles of sovereignty, independence and non-interference. We pursue an independent foreign policy and our conduct of external relations is based on a balanced outlook. No one compromises on nationalism. For us, nationalism is the protection of our sovereignty, territorial integrity, national independence, and fulfilment of our national interest. We are a proud people of a country that always remained independent throughout its history. Our sense of nationalism does not harbour ill will against anyone. Our people have always demonstrated great degree of resilience in times of difficulties and their confidence was never shaken. Amity with all and enmity with none is our motto in foreign policy. We seek to foster relations with neighbours and all friendly countries around the world based on justice, sovereign equality, mutual respect and benefit. When it comes to Nepal-India relations, the enablers for cordial friendship and rewarding relationspartnership are already there. We must build on those enablers to boost our relations. We must seize the opportunities to make our relations fruitful to the lives of our peoples. As close neighbours, we share a common destiny which demands collective pursuit of prosperity. As I already said this afternoon, I have come to India this time with a mission to explore ways and means to enhance our relations to newer heights, commensurate with the realities of the 21st century. We want to erect a strong edifice of trust so that our relations always remain harmonious. We want to create a model relationship which makes not only us but our posterity equally proud of our accomplishment. A relationship that is cherished forever. Everybody has a role to contribute towards realizing this goal. With this spirit in mind we have tasked the EPG-NIR to come forward with concrete recommendations on making Nepal-India relations truly beneficial for both of our countries and peoples. Our intention is genuine and larger Indian intelligentsia have a duty to spread the message of the need for a positive transformation in our relationship. I hope this gathering could serve this useful purpose. During the visit, I had frank, open and comprehensive talks with Prime Minister Modiji. Our conversation was focused on the same direction. 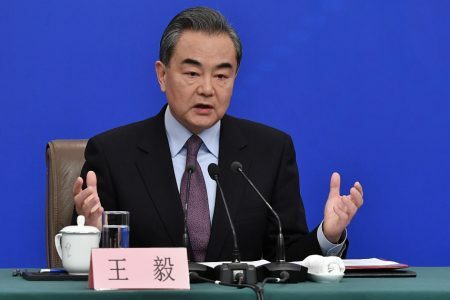 You are already aware of the important agreements we reached on railway and inland waterways connectivity as well as cooperation in agriculture. I firmly believe, and hope you all would agree, a peaceful, stable, prosperous and democratic Nepal is in the interest of India as well as that of our larger neighbourhood. Let me, therefore, conclude by reiterating my determination for closer and mutually rewarding relations between our two countries in this 21st century. I thank you once again for such a wonderful opportunity.